Tobacco companies are not known to be the fairest of fighters in market battles. But Philip Morris International (PMI) seems to have gone to extremes in its grand strategy to sweep the Indian market, where an estimated 2 million people take up smoking every year. A presentation on the Indian market by Philip Morris (the makers of Marlboro cigarettes) that has been accessed and released by Reuters news agency recently singles out some anti-tobacco groups for special attention. And from among anti-tobacco lobbyists, it marks out the photograph of Dr K Srinath Reddy – a prominent cardiologist from AIIMS, an expert on public health, and chairman of the Public Health Foundation of India (PHFI) – with a red circle. 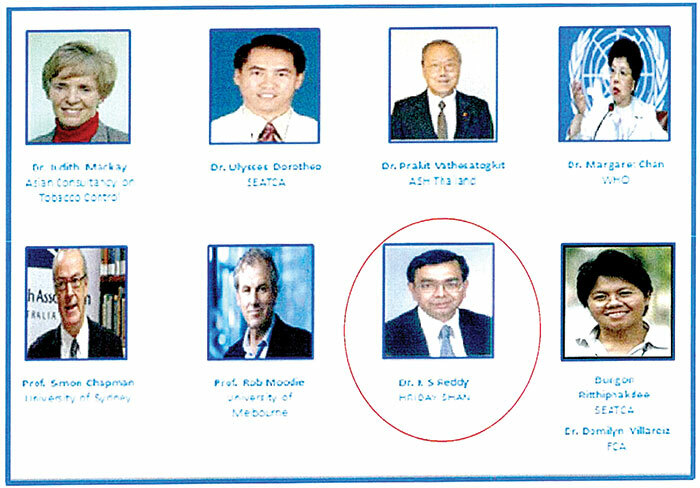 Dr Reddy’s photo finds its place among those of seven other global advocates of anti-tobacco policies, including Dr Judith Mackay, former advisor to the WHO; Prof Rob Moodie, Australia-based public health expert who advocates a dedicated tobacco tax; and Prof Simon Chapman, an acclaimed tobacco-control activist. But none of these is marked out in red. “I deem it an honour,” says Dr Reddy. “I regard the tobacco industry marking me out as a principal adversary the best possible recognition of my impact as an advocate and agent of change.” HRIDAY, or Health Related Information Dissemination Among Youth, which he set up in 1992, during his tenure at AIIMS as a cardiologist, educates youth about the dangers of tobacco and alcohol and encourages them to follow nutritious diets. Besides, PHFI has been at the forefront of anti-tobacco advocacy among policymakers. The singling out of Dr Reddy and some groups may be part of a global offensive by tobacco giants. On July 19, World Health Organisation (WHO) published its report on the global tobacco epidemic, in which Dr Douglas Bettcher, its director for prevention of non-communicable diseases, pointed to the continuous interference of the tobacco industry in government policy-making as a deadly barrier to advancing health and development. Dr Bettcher did not name any country, but from how PMI’s strategy honchos put forth their roadmap for India, it’s clear that India is in their crosshairs. Importantly, Dr Reddy has been representing India in important tobacco control conferences. In 2003, he was a key negotiator of the Indian delegation, appointed by the government for the FCTC, the world’s first public health treaty related to tobacco. Last year, when the seventh session of the Conference of the Parties (COP7) was held in India for the first time, Dr Reddy was once again appointed key negotiator by the Indian government. His organisations have worked in tandem with the health ministry on the external evaluation of the National Tobacco Control Programme in 2012-13. Says Bhavna Mukhopadhyay, executive director of VHAI, “We are on the hit-list of these companies because our work is making a difference in terms of tobacco consumption. We are able to influence policies and having an impact.” The VHAI works with the health ministry in its National Tobacco Control Programme (NTCP). Its representatives were on the expert committee on increasing the size of the pictorial warning mandated on all tobacco products to 85 percent of the package. The organisation also provides expertise and shares evidence on anti-tobacco use. At the cutting edge, it works on the implementation and compliance of the Cigarettes and Other Tobacco Products Act (COTPA), 2003, by sensitising important stakeholders and supporting the local administration with technical expertise and by creating public awareness. As to targetting by tobacco giant Philip Morris, like Dr Reddy, she says it’s a “badge of honour”. For Mukhopadhyay, the fall in number of tobacco users by 81 lakh, according to the WHO Global Adult Tobacco Survey-2 (2016-17), is a big dent on the tobacco business. “Take these figures as a decline in the number of tobacco buyers. This plunge in tobacco consumption from 34.6 percent in 2009-10 to 28.6 percent in 2016-17 shows how tobacco companies have lost business in all these years,” she says. Governance Now contacted Philip Morris’s Delhi office for comments, but they refused to share contact details or e-mail IDs of executives. 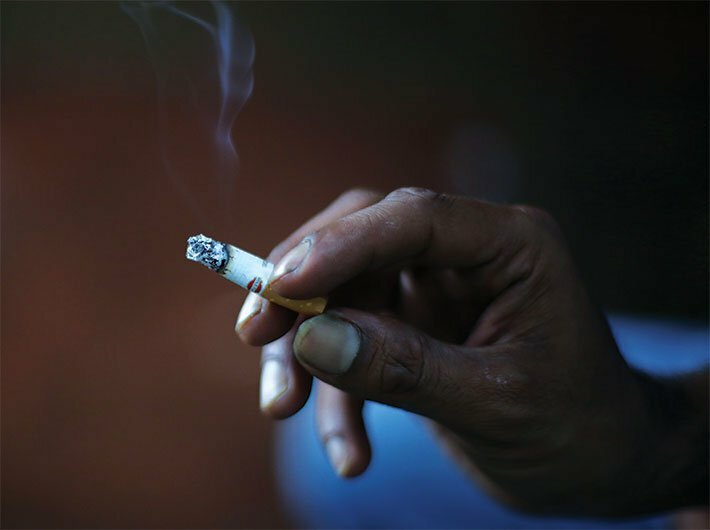 The PHFI, the Institute of Public Health (Karnataka) and VHAI’s state unit in Assam receive funds from Bloomberg Philanthropies, provider of the biggest anti-tobacco funding in Asia. The group has since 2012 spent almost $4 million on 12 anti-tobacco advocacy groups. In the last six months, however, the funding of these organisations has been disturbed. The foreign funding licences of the PHFI, the Assam Voluntary Health Association (which works as an autonomous unit VHAI, as do all of its state-level units), and the Institute of Public Health were not renewed: the termination of the Foreign Contribution Regulation Act (FCRA) licence means they cannot accept funds such as those provided by Bloomberg Philanthropies. Similarly, it has been three months since Dr Reddy’s PHFI lost its FCRA licence; again, there has been no response from the government to questions on why the licence has not been renewed. Although there has been talk that PHFI may have been targeted because of Dr Reddy’s perceived closeness to the the previous UPA regime and Dr Reddy has offered to quit to make way for someone else to run the show so that the work continues, there are sinister undertones to the whole affair and how sharply the blow was struck. People from the field are inclined to believe that the tobacco lobby might have been at work. The onslaught takes some devious tacks. Says Ashim Sanyal of Consumer VOICE, a voluntary action group that filed a suit against the ‘Made for Each Other’ campaign of Wills cigarettes, an ITC brand, “Lobbying is generally through putting frontal faces. 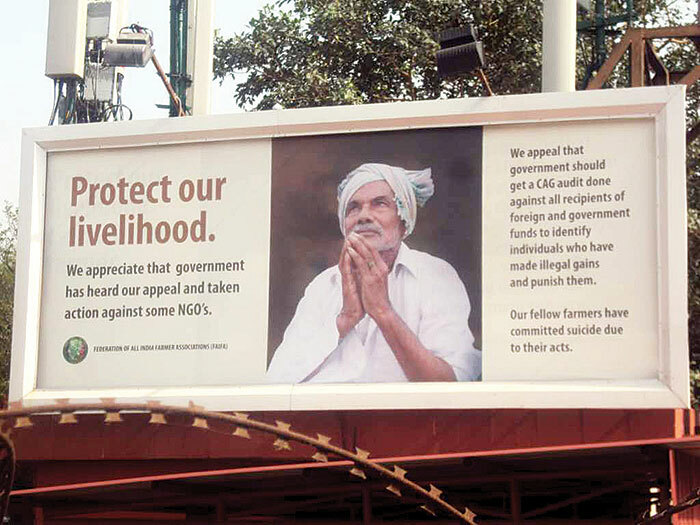 There are tobacco farmers who are made to stand as representatives on behalf of tobacco industries.” He was referring to groups such as the Federation of All India Farmers Association (FAIFA), which has been putting up posters of forlorn farmers and seeking to “protect their livelihood” against the onslaught of “foreign-funded anti-tobacco lobbies”. FAIFA, a society registered under the Andhra Pradesh Societies Registration Act, 2001, was set up in 2015 and is headquartered in Guntur. Andhra Pradesh is one of the major tobacco-producing states of India. FAIFA came into the limelight when India hosted COP7 (or the seventh Conference of the Parties, where all parties to the Framework Convention on Tobacco Control meet for discussion) last year. It demanded that the prime minister boycott the convention; it was riled the most when the WHO’s FCTC convention secretariat rejected its application for the status of observer at the conference. Generally, the media, industries and private organisations are not allowed to attend the convention because they might have connections to the tobacco industry. FAIFA then went to Delhi high court on the grounds that the conference guidelines are not binding on the Indian government as there is no domestic law enacted by parliament to adopt/implement the treaty. It’s petition also said that India’s hosting of and participation in COP7 went against the interests of tobacco farmers. The argument runs somewhat like this: the FCTC (which, under Article 21, speaks of providing alternatives to wean tobacco farmers away from the cash crop) is not enacted by parliament nor is there any Indian law making it binding on the country, whereas the Tobacco Board Act of 1975, an Indian law, is for promotion of tobacco cultivation. So the government should rather go by an Indian law. “We are working on behalf of farmers. Our livelihood should not be affected,” says Murali Babu, general secretary of FAIFA, himself a tobacco farmer, though by no means a small farmer: he told Governance Now he owns 40 acres of tobacco-producing land. He says FAIFA is funded through contributions from farmers. But then, FAIFA’s petition to Delhi high court, while pleading the case of farmers, makes particular mention of Bloomberg Philantrophies and the funds granted to Dr Reddy’s PHFI. (The Bill and Melinda Gates Foundation also finds mention.) It says the ministry of health report on tobacco control in India is jointly supported by the Centre for Disease Control and Prevention Foundation (CDC), one of the entities administering Bloomberg grants; and that Dr Reddy receives grants from Bloomberg and is a contributor to the tobacco report. Public health campaigners wonder why a farmers’ organisation, instead of presenting the legit case of farmers, would particularly go against an anti-tobacco campaigner and those who fund him. Of course, big farmers stand to lose huge profits if tobacco consumption goes down drastically through the efforts of people like Dr Reddy. There is also a case to be made for small tobacco farmers, who may find it difficult to shift to an equally profitable alternative crop or occupation. But rich tobacco growers have already profited enough over many generations to be able to diversify into other businesses. Considering the sustained campaign and its pointed targeting, there seems to be more than what meets the eye, namely, those posters and campaign hoardings depicting poor farmers. Recently, FAIFA has also jumped into the fray in the PIL in Bombay high court on the LIC stake in ITC and other tobacco companies (see profile of lead petitioner Sumitra Hooda Pednekar on page 24). Advocate Waseem Pangarkar of MZM Legal, who is fighting the case on behalf of petitioners Sumitra and others, says, “Farmers have nothing to do with the case! It is completely a financial issue, which demands disinvestment of public fund from cigarette manufacturing companies. FAIFA’s interference is a way to divert attention.” FAIFA has also started a campaign opposing the five percent GST on raw tobacco, saying that it’s an unrealistic tax that will “severely endanger their livelihoods”. Also, the parliamentary standing committee on science and technology, environment and forests, in 2016 discouraged expenditure incurred by the government in relation to tobacco-related disease treatment and death caused by it. It recommended disincentivising tobacco production and encouraging farmers to move to other profitable crops. Against all that, lobbying goes a long way: the tentacles of industry reach right up to parliamentarians. The delay in the implementation of pictorial health warnings covering 85 percent of cigarette packets is a fine example. In October 2014, government announced the introduction of larger pictorial warnings. As planned, the decision was to come into effect on April 1, 2015. Dilip Gandhi, the BJP MP from Ahmadnagar who steered the 15-member subordinate legislation committee, interacted with representatives from the tobacco lobby. Eight of its members were opposed to having bigger warning photos. Taxes alone will not work. Tobacco control calls for a multipronged effort: if providing tobacco farmers with an alternative is important, equally important is education against tobacco use and effective policy interventions. In the last two, it’s the voluntary sector that has played a sterling role. The health costs of tobacco use – at the individual and the national levels – are too high to ignore the aggressive and cynical war the tobacco lobby has unleashed on such NGOs. Extend prohibition on advertisement, promotion and sponsorship of tobacco products to mediums like films, internet, mobiles, etc. For the last two years Dr SK Arora, chief tobacco control officer and additional director health, Delhi, has been working on a mission with befitting zeal. He has been campaigning against surrogate advertisements by tobacco firms. For this, the man in his fifties visits dozens of kiosks and writes to a plethora of authorities to do something about misleading advertisements. 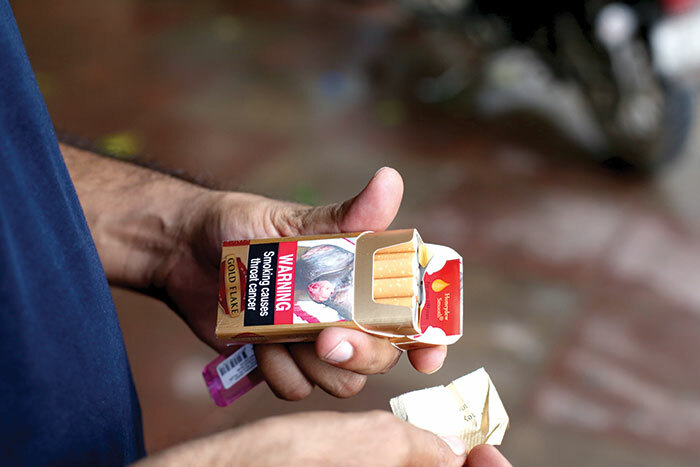 “Pataka Industries Pvt Ltd, Shikhar Gutka Pvt Ltd, Kuber Group (Kuber khaini) and Som Pan Product Pvt Ltd (Dilbag) are the tobacco companies violating The Cigarette and Other Tobacco Products (Prohibition of Advertisements and Regulation of Trade and Commerce, Production, Supply and Distribution) Act, 2003 [COPTA] through surrogate advertisements,” says Arora. He tells Governance Now that the Act prohibits direct or indirect promotion of a tobacco brand/trademark. But these companies use some innocuous products to popularise their brands. For example, Pataka Industries, a bidi manufacturer, is promoting the brand by advertising Pataka tea. Likewise, Shikhar, Dilbag and Kuber are primarily gutka/chewable tobacco manufacturers but are promoting the brand as pan masalas. Arora has been writing letters to the health ministry, the Advertising Standards Council of India and Delhi police, among others. In two years, his department has not received any response except from the directorate of advertising and visual publicity (DAVP), the centre’s publicity wing. “They said they are not the enforcement agency,” says Arora. Delhi, he says, is the only state in the country which has called for filing FIRs against surrogate advertisements. Of course, “it’s not Delhi alone where violations are taking place, surrogate advertisements are shown everywhere. But Delhi is the state which has taken the initiative,” says Arora. Usually, the main task of a tobacco control office in a state is to raise awareness about the ill effects of tobacco as well as about tobacco control laws to help users to quit tobacco. Arora has taken up the task in full seriousness. 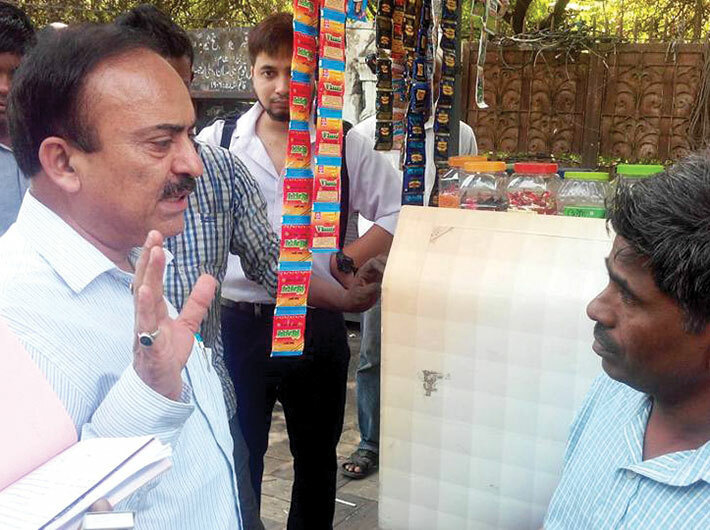 Recently, his concerted efforts stopped big cigarette companies from putting advertisements at point-of-sale anywhere in the capital. He says tobacco control is possible only if COTPA is enforced effectively. “Though we need amendments or extensions in certain legal provisions, we have enough laws and the need of the hour is to enforce the existing laws religiously and genuinely. We should strengthen implementation through different modalities,” says Arora.